Globalisation has led to global supply chains that often involve many stakeholders across the world in complex relationships. For supply chain managers who aim to run their operations in a sustainable manner, this leads to various challenges - and many opportunities, as technology makes constant progress. For starters, each transport links of the supply chain has to run in a sustainable manner itself. Analysts have claimed that there are plenty of options to make shipping and terminal operations more sustainable (read more), and with the IMO's latest agreement of capping greenhouse gas emissions by 50% by 2050 this initiative has finally found a regulatory framework (read more). However, there are plenty of opportunities for overland transportation and in fact the entire supply chain, to operate in a sustainable manner which makes for a holistic concept. When talking about overland and more specifically truck transportation, the development of "platooning", also known as "autonomous driving", seems to have gotten a lot of attention. This system runs with a lead haulage truck, which guides a convoy of drone trucks following behind closely. Platooning contributes to more efficient operations, cost reduction and lower emissions. As the system reduces margin for human error, accidents are set to decrease, too, which leads to societal benefits and cost saving for the economy. However, technology is not quite there yet to implement the system. Platooning requires development of a technology called “lane-keeping” that is still not fully finalised. The challenge is that once the lead truck needs to change lanes on the highway, the trucks following behind must have drivers fully engaged to perform the lane change as well. In addition, a legal framework, an insurance framework and new roadway infrastructure all still need to be developed and agreed. New technology aimed at reducing emission also incorporate last-mile solutions into the automated shipping industry. For example, there are concepts for driverless trucks, robots or drones that deliver items on the last mile. Another option is applying hybrid energy to tractor-trailers. By installing an intelligent electric drive axle on the trailer, the system uses regenerative braking to capture and save energy created when the vehicle brakes. This energy is then being reused to provide auxiliary power when needed, such as when the truck is driving up hills. The technology isn’t exactly new, but rather like the KERS system used on Formula One racing cars, but it has not been applied to trucks before. What works for passenger transport, can work for freight, too. This is the idea behind "Uber for trucks", which aims to connect businesses that need to ship freight to the trucks have excess capacity. Here Uber goes one step beyond its taxi concept though and has recently started to run self-driving trucks in a project in Arizona. Uber uses a transfer hub model, in which the trucks drive autonomously on the highway and human drivers take over for the last miles. When used as a fuel for trucks delivering goods, LNG has the potential to offer fuel cost savings and reduce sulphur emissions, particulates, nitrogen oxides and greenhouse gas emissions when compared to conventional diesel. However, the use of LNG as a fuel and its ability to lower GHG emissions is contested (read more). Burning LNG in spark-ignited engines is quieter than burning diesel in combustion engines. This means LNG-fuelled trucks can operate longer under noise restrictions, for example when delivering goods to places in residential areas. Even if decreased emission of pollutants would not be a factor, society benefits from lower noise emissions. Italy has recently launched a series of legal initiatives to boost the introduction of LNG as alternative fuel for heavy truck freight. With the inauguration of the 20th LNG fuelling station and following the well know expertise of the leading Italian truck manufacturer IVECO, it seems now the trend is setting. 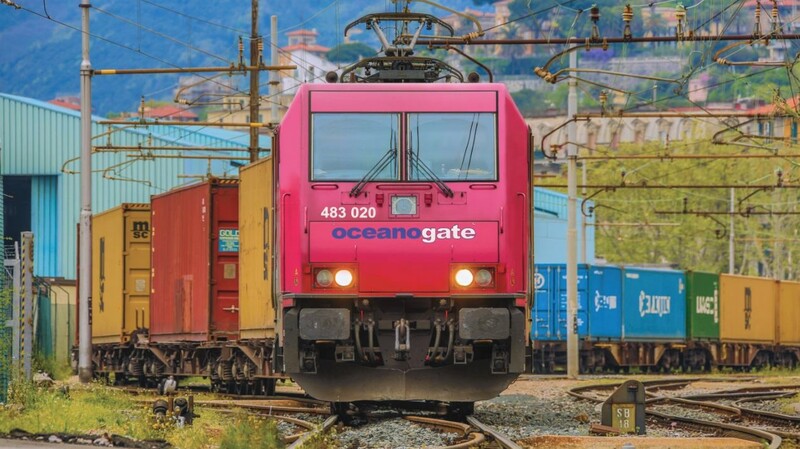 When it comes to rail freight, this mode of transport already trumps trucking, aviation and other transportation sectors in moving goods while producing the least carbon emissions. Over the past quarter century, the rail freight industry’s fuel efficiency has increased significantly, reducing greenhouse gas emissions as well. Nevertheless, UIC, the International Railway Association, has issued a voluntary multi-stakeholder initiative on sustainable, low carbon transport and proposed a transport sector challenge in the framework of the green growth agenda and climate change perspective for 2030 and 2050. This challenge sets out ambitious – but achievable – targets for the improvement of the rail freight industry's energy efficiency, reductions in GHG emissions and a more sustainable balance between transport modes. The aim is to reduce CO2 emissions from train operations by 50% by 2030, and by 75% by 2050. The energy consumption from train operations is to be reduced by 50% reduction by 2030 and by 60% reduction by 2050. This goal is set to be achieved by technical development and improved management leading to greater efficiency. This includes the decarbonisation of energy consumption, i.e. reducing the dependence on fossil fuels and improving energy security and a better use of existing rail assets such as infrastructure and rolling stock. Investments to develop new rail networks benchmarking as well as reporting to drive improved performance are to be applied as well. How closely sustainability is linked to new technologies becomes even clearer when looking at blockchains. A blockchain is made of an electronic ledger with a list of entries (blocks), which are linked together and secured by encryption. Blocks are added by any user of the ledger, which includes a pointer to the previous block (a hash), a time-stamp and transaction data. As blockchains consist of a shared, decentralized database with immutable, encrypted copies of the information stored on every server or “node” in the network, the systems validate entries or changes in the ledger through a cryptographic consensus mechanism and thus circumventing the need for intermediaries. Blockchain technology is inherently resistant to tampering and modification. Once an entry is made, including transaction data and a time stamp, it cannot be modified unless all subsequent blocks are also modified, which would signal the collusion of most the users in the network. Therefore, blockchain offers huge advantages over centralised databases and it enables otherwise trust-less parties, such as individuals and firms unknown to each other, to interact in seamless peer-to-peer transactions. Blockchain technology has emerged as a good solution to solve core problems in supply chain transparency. It offers an opportunity to facilitate the flow of data and gives offers brands and retailers the options to track and trace commodity goods through their supply chain. Furthermore, a simple and automated processes could facilitate a switch to larger scale and more efficient adoption of certification initiatives, which could ultimately free up time and resources. A range of technology and supply chain companies are already developing blockchain-based supply chain management (SCM) software and numerous pilot projects launched last year. Early research results suggest that blockchain-based solutions will reach scale over the next five years, which could truly lead to a transformation in global supply chain management. There is no one-size-fits-all solution to increasing the sustainability of supply chains. However, the exchange of information and the connection of various market players are key. Providing more transparency in addition to reducing emissions provides the right framework to take this initiative further.